Spring Heeled Jack is a legend I have been vaguely aware of since childhood and in Sheffield it was common during the 1950s for anybody called Jack to have the nickname, Spring Heeled. Also this particular urban legend has spawned lots of offspring, Bram Stoker’s Dracula, Batman, the Shadow all owe something to Jack, it’s a myth that has been updated and changed over time, through written stories, television, comic books and across all media. The dark supernatural being that leaps out from the shadows and claims an innocent victim before disappearing without a trace, it’s the stuff of nightmares, stories to scare your children with and originally a Victorian horror morality play. My own take on the legend, The Attercliffe Prowler was released in February and is a story that is primarily set in 2011, but draws heavily on three specific earlier Sheffield sightings of Spring Heeled Jack. All three historical events described the creature similarly, a laughing red eyed, pitch fork wielding, fire breathing demon with the ability to take enormous leaps, that terrorised women by ripping at their clothes and the sight of his demonic features drove many insane, before Spring Heeled Jack disappeared back underground. The sightings of Spring Heeled Jack in 1973 in the Attercliffe area of Sheffield when he was renamed the Prowler, the title I choose for my Graphic Novel. And finally, a letter to the editor of the Sheffield Times in 1808 that said: ‘Years ago a famous Ghost walked and played many pranks in this historic neighbourhood’ and this report was thirty years before what is often referred to as the first sighting of Spring Heeled Jack in London and this was the starting point of my story. ‘Years ago’ could have been 1773, so therefore why not 1673, 1473 and there were the reports from 1873 and 1973, does he return to Sheffield every hundred years, but then why has Jack returned in 2011? And this time Spring Heeled Jack is renamed the Pitch Fork Killer, by the local press and murders women rather than just ripping at their clothes, but I won’t ruin the end of my story. The locations for my updated version of the urban myth are shaped by the earlier reported sightings and family connections link my cast of characters back to those earlier events. The story also covers how the London Media and the Penny Dreadful’s stole Spring Heeled Jack in 1837 and this story just reclaims him for Sheffield and brings him to a modern world populated by hundreds of his fictional serial killer offspring. 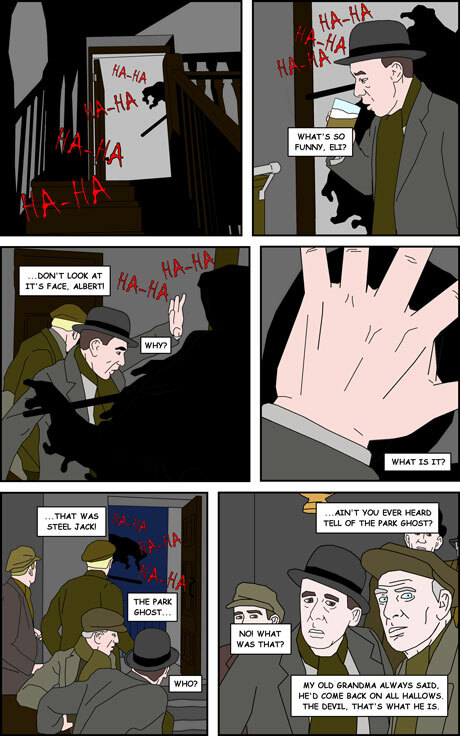 The Attercliffe Prowler: Tunnels of Hell was the second in the Sheffield Series of CD Graphic Novels that can be viewed on your computer in JPEG or PDF formats and therefore can downloaded onto other devices, including some mobiles with the right software. The first in the Sheffield Series was Meadowhell: The True Horror of Shopping Revealed released in September 2010, but set in 1990, just before the Meadowhall, a large Shopping Mall off the M1 opened to the public. It deals with the Police investigation and the bizarre circumstances surrounding the grizzly and surreal murder of three Security Guards. The third and fourth in the Sheffield Series were out on Monday, July 18, ‘Football Crazy: The Theatre of Nightmares on the Road to Insanity is one Graphic Novel, but it’s available in Red or Blue, Sheffield United or Wednesday and follows the F.A Cup run of which ever side you support. One of the Sheffield players is found dead and the story follows the Police’s efforts to catch his killer, but their investigation becomes increasingly more complicated and dangerous. CDComics Graphic Novels are full of local Sheffield landmarks, a city that has its fair share of myths and legends and the aim of CDComics is to make Sheffield the UK equivalent of Salem in the US. A huge undertaking as I writes and illustrates all the stories, but it’s good to have a dream or should that be nightmare? I’m a lecturer in Graphics and previously taught Media and Film, so this is really just fun for me, some people fish, some people hill walk, I write and illustrate stories for fun.